Successfully Added Car DVD Player + TV Tuner - In-Dash 2-DIN + 7 Inch Touch Screen to your Shopping Cart. 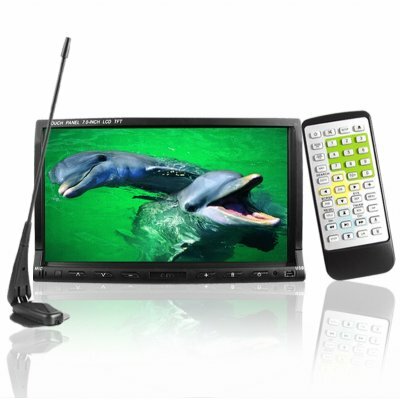 Chinavasion classic 2-Din car DVD player with the same great features like the 7 inch screen and built in TV tuner, but with new features such as full touch screen control. With this upgraded car DVD model with the same wholesale price, you will be getting a complete car entertainment system. It comes with other such great features as a new USB port and SD/MMC card reader for playing digital media directly, 2 AV OUTs, 1 AV IN and rear view camera IN for connecting outside media equipment, included TV antenna, and cool back light illumination for night use. This classic Chinavasion touchscreen car DVD product is still available with no MOQ, and Internet famous blind dropshipping, so order your sample today..
on 2008-12-14 07:57:28 Very Good Item!!!!!!!!! !